Eventually all tires get old. The process of aging can be noticed through the increased hardness of protector rubber and is determined by small cracks on the tire surfaces. Increased rubber hardness leads to changes in tire traction. The reasons for occurrence of cracks: low-quality rubber, improper tire storage, influence of exhaust gases, ozone and sunlight, repeated overheating, moisture, untimely maintenance of tires, driving with flat tires, car overloads. Another reason of tires cracking is infrequent vehicle operation. When the natural tension and compression process does not influence the tires, special compositions designed for tire protection stop working, which increases the probability of cracking. 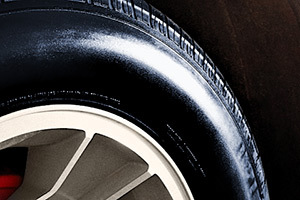 Application of special care products for tires allows to prolong their lifetime, restore their attractive look (the effect of “wet tires”), make the tire surfaces more resistant towards all kinds of contaminations, which makes it possible to ensure protection of tires from cracking, discoloration and influence of various atmospheric phenomena. 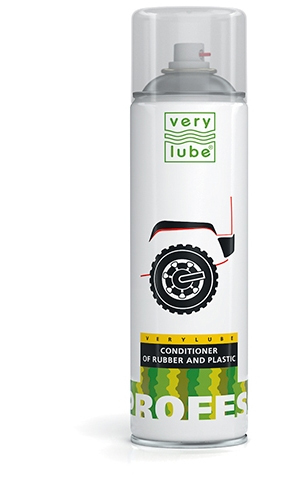 VERYLUBE Conditioner for rubber and plastic – spray for care of rubber and plastic articles. VERYLUBE Universal silicone lubricant – universal thick silicone lubricating spray. If treated regularly, the tire surfaces become smoother and more resilient.